Update: Watching the Winter Olympics schedule of events online and keeping track of the medal count are our focus now that the Opening Ceremony is over, and we've updated this story to reflect that. 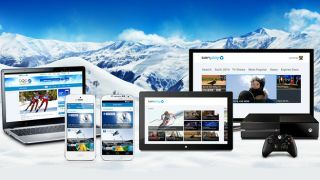 Live streaming the Winter Olympics online has become as much of a tradition as the torch-lighting ceremony because TV networks haven't been willing to broadcast the games in real-time through normal channels. The 2014 Sochi Olympics in Russia are no different, as the host city is half-way around the world for many fans. In the past, time-zone differences have meant watching tape-delayed events on TV, including some of the most popular sports: figure skating, alpine skiing, snowboarding and hockey. The internet, especially Twitter, has played spoiler to who won the gold medal in each. But the web has also provided a solution through online streaming more Olympic events than any one network can handle. NBC is in the middle of airing more than 1,500 hours of Winter Games coverage through its TV networks, websites and apps. It's a vast amount of content, but finding the more than 1,000 hours that are supposed to be streamed through the web has become an Olympic sport of its own and requires practice, practice, practice. The easiest method of keeping track of the Winter Olympics schedule is through Google, as the search engine flexes its Knowledge Graph when you type in "olympics schedule." It breaks down of the actual event start times (in your time zone) according to the online live stream. That's often different from the tape-delayed Winter Olympics TV schedule because stations can't support as many broadcasts as the internet. Of the 98 Winter Olympics events streamed live, this week's most exciting events that you should see in real time include Men's Ice Hockey quarterfinals begin on Wednesday with Sweden and Slovenia dropping the puck at 12:00 a.m. PST (8:00 GMT, 7:00 p.m. AEST). Team Russian fights on against Finland at 4:30 a.m. PST (12:30 GMT, 11:30 p.m. AEST), while its Team USA vs the Czech Republic and Team Canada vs Latvia is a much more reasonable hour in North America: 9:00 am PST (17:00 GMT, the next day 4:00 a.m. AEST). The Men's Ice Hockey semifinals are scheduled for Friday and the finals can be watched online during the weekend, Saturday and Sunday. In the meantime, Women's Ice Hockey also has an exciting match coming up, with Team USA vs Team Canada in the finals on Thursday at 9:00 am PST (17:00 GMT, the next day 4:00 a.m. AEST). More skating and less checking happens in Figure Skating's Ladies Short program at 7:00 a.m. PST (15:00 GMT, the next day 2:00 a.m. AEST) on Wednesday, and Ladies Free Skating at the same time on Thursday. First-time and veteran Olympians have descended upon Sochi, whether or not the Russian beach town was ready for the Winter Games. Olympic athletes like Lolo Jones from the USA bobsled team certainly seemed ready. She has participated in both Winter and Summer Olympic games having also been a track and field runner. Jones is still in the running for her first medal, but is unlikely to stand on the podium in her current standing. The good news is that fellow American bobsled team USA-1, Lauryn Williams and Elana Meyers, are sitting in first place. GoPro Hero 3+ owner David Wise from Team USA also helped spearhead the debut of Half-pipe Skiing at the Winter Olympics this year, and won a gold medal doing so. You can watch his mesmerizing videos from the first-person and pole perspective. From the UK, Skeleton star Lizzy Yarnold spent her Valentine's Day hugging a sled while traveling down a frozen track. Her dedication paid off. The World Cup winner rocketed her way to a gold medal at g-force speeds on February 14. British Curing stars Eve Muirhead and David Murdoch are traveling down the ice sheet to stardom too. Muirhead leads the British women's curling team on Thursday, February 20 at 8:30 GMT, while Murdoch does the same for the Men's team that same day at 13:30. Both bronze medal-level events will be live streamed and broadcast on BBC Two at those times. Google is also using its Knowledge Graph to keep track of Winter Olympic medal counts. Its special search syntax feature has really expanded beyond finding out the weather and movie times. Germany is still leading with the most golds, while the US and the Netherlands are tied with the highest overall medal counts. Team Norway is in second place with seven gold medals and 18 overall. Team USA has 6 gold medals of their over 20 medal total, while Team Great Britain has one gold and bronze thanks to Skelton champion Elizabeth Yarnoldand and snowboarder Jenny Jones. Australia a three medals, one silver care of half-pipe snowboarder Torah Bright and two bronze medals. The medal count is still far from final, as the Winter Olympic Games in Russia don't end until February 23, so expect the standings to change every day.